This banner came up not far from where I live yesterday, the day after three bomb blasts killed about 20 and injured about 100 people in Bombay. Genuine question: Have you ever seen a similar banner with "Hinduism" on it instead of "Islam"? Why or why not? --whether you agree or disagree..Indians are mostly tolerant because of sanatana dharma..we believe in many paths to one goal. the problem arises when one starts to preach there is only one path..
1) Because Hinduism - whatever that is (there is no such thing as hindusim) - does not preach 'An Eye for an Eye'. For the same reason that just about no one will raise that question for Buddhists, Parsees, Jains, Jews or adherents of Spirit Quest, the spirituality of many aboriginal Americans. They are not associated with relentless, transnational, ideological terrorism, with the long term objective of establishing a monolithic, dogmatic, theocratic state. There may be individuals here and there who say and do crazy things, but even in those situations, they do not cite scriptural sanction for their actions. None of them have a history of imposition, let alone aggressive imposition, of their theology and ethos. The vast majority of people in the world do not view these religions or their adherents, as being an ideological threat to the world at large. (i'd think there are versions of this in most every faith). This sets everything into a different frame, that of the definition of innocence. did somebody insult your god? your holy book? blaspheme? consort with people of other faiths? leave your faith? if yes, do you consider them innocent? Which faith comes closest to this? I believe Buddhism does decently in this regards. Any more proof needed of your hatred of hinduism and hindus? Whether we are tolerant or not is besides the point. 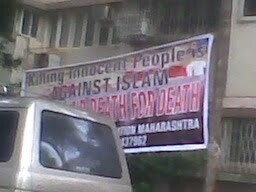 When bombs go off killing 21, some Muslims decide to put up a banner saying killing innocents is against Islam. This is, I presume, because they know that there are scum who call themselves Muslims who have killed innocents, whether in Gujarat or Bombay or elsewhere. All I am asking is, have there been similar banners saying killing innocents is against Hinduism? After all, we all know that there are scum who call themselves Hindus who have killed innocents too, whether in Gujarat or Bombay or elsewhere. Instead of pointing to such banners (if they exist) or explaining why we don't see them (if they don't exist), I get stuff about tolerance, and meaningless counts of "Hindu terrorists" and, of course, the weary old accusation that I hate Hindus and Hinduism. It's a simple thing: just as Muslims have killed innocents in India, so have Hindus. Not even the bankrupt apologists on this page can or will deny this. If the followers of one religion pronounce that such killing is against their religion, do the followers of the other religion do the same? Why or why not? And yet consider what happened in Sri Lanka. From the revered Buddhist ideologue Dharmapala's rhetoric (about "dirty Tamils" and the "vulgar practices" of Hinduism), to the recent Channel 4 documentary about army atrocities at the end of the campaign against the LTTE, Sri Lankan Buddhism does not quite cover itself in glory. Every religion has managed to encourage its followers into prejudice and evil against followers of other faiths. No exception. Including those on this page who will suggest that Muslims are *all* "associated with relentless, transnational, ideological terrorism." So I say, please let me stay as far from every religion as I can. Thank you. Please do so. Oh and can you tell me which religion the Khmer Rouge and other assorted communists who have killed more people than the followers of any of the religions you have mentioned. What about that mass murderer Che guevara who you adore and write glowing tributes to? Please do not then encourage secular essay writng contests. I think it is an effort by the banner-posting team to step forward and join in the condemnation of the bombers. As well as a pre-emptive statement, should anyone claim that this heinous act was "for Islam" even if committed by members of that community. I think it would be a step forward for Hindus to post a similar banner and have a handshake - these two being the largest religion sectors of the Indian population. Of course we cannot expect this of CK and N. Or can we? As I commented back then, I think the SL problems were more based on ethnicity than religion: Sinhala vs. Tamil and that godman was probably only part of the problem? I dont know the composition of the SL population but there must be Sinhala Xians and Muslims if not Hindus. This is like the Chechen and Kashmir issues becoming "islamic" just because the majority of the ppl there are of that faith. At least that's my view. As regards religion, I'm not selling you any :-) as a practising Hindu, I respect Buddhism and yet I'm not planning to convert myself! Talk about misdirection. Bombs go off in Mumbai and you focus on trash-flinging and one banner. If the perpetrators were thought to be Hindu, is this what your blog would be focussing on? Would you focus on trash-flinging? Would you write a post on a banner put up by some Hindus and wonder whether Muslims/Christians put up similar banners? If Hindus did put up such a banner, would you even care and would you even praise them? And why is such a banner even necessary? So because you haven't seen such a banner put up by Hindus, what conclusion do you draw from this? And are any conclusions drawn from this valid conclusions? If you hadn't seen this Muslim banner, would you have written a blog post asking why Muslims haven't put up such a banner? Silly and immature post. "It's a simple thing: just as Muslims have killed innocents in India, so have Hindus." It's even more simple than that. So have Christians killed innocents in India ( and certainly more elsewhere around the world). Please put up photos of the banners by Indian Christians condemning Christian aggression/inquisitions/ cruelty around the world (including India) Thanks. i get and accept your point. i think even if its not put up near a crime scene, online and away from the crime scene, I am sure its communicated. I tend to agree with Jai C. The Sinhalese or the Chechen issues were hardly religulous issues. It is an important distinction. Yet though I practice no religion myself, okay I practice cricket sometimes, I will still stand up for minority communities because that is the essence of democracy. "Muslims are *all* "associated with relentless, transnational, ideological terrorism."" But that's just the point. No Hindus, Buddhists, Jains, Parsees, Spirit Quest and Jews, are associated with transnational terror. Despite injustices to at least some of the above groups. And none of them are seen as a long term threat to secularism, pluralism, democracy and progress. You ask - Have you ever seen a similar banner with "Hinduism" on it instead of "Islam"? I answer - no, but that doesn't mean it doesn't exist (I didn't know this banner existed till I saw this pic here), and neither does it mean that Hindus (to pick the same example as you) don't condemn killing in the name of religion. Or Christians or Sikhs or whoever. You ask - "If the followers of one religion pronounce that such killing is against their religion, do the followers of the other religion do the same? " I answer - As the saying goes, the plural of "anecdote" is not "data". One banner does not a groundswell make. This one banner near your house does not prove that the entire mass of followers of a certain religion condemns killing done it its name. It is, however, indicative - agreed. And the reason behind that could in all probability be purely statistical, based on the number of instance of terror strikes (going by who caused them, and which religion was invoked as a cause). You say - "So I say, please let me stay as far from every religion as I can." I say - The expression "terrorism knows no religion" while cliched, definitely has truth to it. If you agree, then why stoke such an argument (which leads to feedback of the kind you refer to in this sentence: "Instead of pointing to such banners (if they exist) or explaining why we don't see them (if they don't exist), I get stuff about tolerance, and meaningless counts of "Hindu terrorists" and, of course, the weary old accusation that I hate Hindus and Hinduism.") by posing an eristic question? For someone who wants to disclaim all religion equally, why suggest that the followers of one religion are doing a better job of condemning killing done it its name, as compared to followers of other religions? If you want to de-link religion from terrorism, then don't deepen chasms that already exist by promoting polemics around the behaviour of people who follow one religion over another. Terrorists are scum, to borrow your epithet. Period. why suggest that the followers of one religion are doing a better job of condemning killing. I suggest no such thing, partly because "condemning killing" (and the demands to do so) is meaningless to me, and partly because I'm truly asking: has anyone seen a similar banner with "Hinduism" instead of "Islam"? The Sinhalese or the Chechen issues were hardly religulous issues. A Buddhist ideologue says "Christianity and polytheism [i.e. Hinduism] are responsible for the vulgar practices of killing animals, stealing, prostitution, licentiousness, lying and drunkenness." This is not about religion? As far as I'm concerned, communism was no different from any given religion. Therefore when I say "please let me stay as far from every religion as I can", I mean communism too. would you even praise them? No. I'm not praising those who put up this banner, why should I praise anybody else who puts up other banners? why is such a banner even necessary? Exactly the question I hoped to provoke with this post. Thanks for asking it. are any conclusions drawn from this valid conclusions? We all know of self censorship, where reasonable folk refuse to express their true feelings on a subject so as to avoid conflict or undue attention from extremists. Perhaps this is the opposite of self censorship; where innocent people are forced to brandish their innocence due to an innate understanding that they are looked upon as guilty. In so doing, they unknowingly endorse an incorrect presumption.